Laboring with a shovel is no longer a thing in today’s harsh winter conditions. But where do you start? A snow blower is a perfect match for every type of snow blowing activity. Whether you have just one car to park or six, there’s always a thrower to pick. In our hunt for the top best, one brand, in particular, stood out. The Ariens snow blower brand has been with us for a couple of decades now, carving their way to the top of the rank. 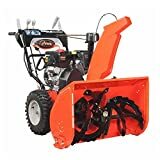 Today, we bring you a detailed overview of their snow blowers in the hope that you’ll find it informative as you pick the one that suits you. Stay with us and learn about the differences in each type; single stage blowers and two-stage blowers alike. Their designs are quite innovative seeing that they have garnered a following through the years. 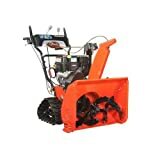 After going through each of the snow blowers above, we are drawn to give credit to the Ariens Deluxe for medium-sized and large residential properties. It has the best durability features including two belts that reduce wear from the engine while delivering high torque. It is easy to steer, and it comes at a reasonable price. For small residences with a good fill of snow, the Path-Pro is a steal. As much as it is a single-stage unit, the engine displacement is high, hence directing it to deliver great throw capacity. The frame is of steel, it is easy to maintain, and you’ll not have a hard time storing it. More so, the wheels provide a responsive ride through the wet snow. Does the product have heated handgrips? Not all Ariens snow blowers have heated handlebars. Only the Professional and Platinum models carry warm handles. With the other designs, you’ll want to pair some snow gloves to prevent loss of body heat as you work. Do these blowers come with the extension cord? No, every gas blower here requires the use of electric power to start the engine. Unfortunately, the extension cord is not included in the packaging. You can buy the Ariens extension cord in online stores. Does the product apply power steering? 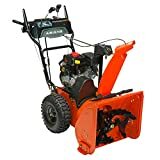 No, Ariens two-stage snow blowers are designed to use an auto-turn steering system. It works like a zero-turn radius which directs the machine when you want to make a turn. The Compact model does not, however, use auto-turn steering but the wheels are self-propelled. The Deluxe design represents one of the best models by Ariens. It is made to tackle tough winters replete with blizzards and piles of snow. You don’t need to get worried when a storm comes calling. The Deluxe with a common name of the “Beast” packs the power and features to take down the highest pile there is. An exclusive Ax254 Ariens Engine manages 254cc power output. What more could for with an engine that propels a 3-blade impeller to move 72tons of snow each hour. The horsepower at around 8HP is enough to get you out of the cold in no time at all. This engine can work in freezing temperatures below 00 and still start up well thanks to the electric start. It also has the provision of using recoil for those days you need to go out, but the power is out. The Deluxe can throw snow effectively over 50ft. It doesn’t stop there since it can also create a path 28inches wide and 21 inches deep with a single pass. How many passes would you need to clean your 3-car driveway? We guess very few at the very least. You’ll love working with the 14inch serrated augers which give you a smooth ride since you’ll not be making stops to remove sticky snow. A Disc-O-Matic drive system graces this machine. You can expect it to offer total control when you are managing the speeds. Together with the self-propulsion and auto-turn steering, it becomes quite easy to maneuver through corners. The tool can detect when you are making the turn, and it does it for you. You are left with holding the handles and directing the snow. With a chute that rotates 200-degrees, you cannot complain about the many possibilities that you can throw the snow. You get to use a single lever to deliver the controls, and as such you are set for the time of your life. It also comes with an in-dash chute deflector. This panel allows you to make adjustments to the discharge chute from where the handles are. The Deluxe speaks of mastery of an art. It is a perfect illustration of practicality in a very powerful tool. If you live in areas where winter brings surprises this is the machine to bag. It proves reliable in all its dimensions including the engine power, drive system, durable construction and the effective controls mechanism. Only that, if you only have a small storage space and dislike servicing big machines, you may want to look elsewhere. For those who claim not to have ample storage area but you still need a machine that packs the muscle. The Compact Track is here to fulfill your delight. The handlebars can fold, and it is quite subtle for a gas powered two-stage blower. Needless to say, it still has an all-steel construction to ensure it survives when the weather is not forgiving. The Compact ST24LET is by no chance just a small machine. It carries the Ax208engine by Ariens which sees it pass a 208cc displacement. This output allows it to accelerate a three-blade impeller at very high speeds. The impeller responds, in turn, to help break down the ice and packed snow to discharge it through the chute at rates of 52 tons per hour. The engine carries cast iron sleeves to ensure it lasts a decent period. Not forgetting; it can throw snow up to 40ft with no hassle. Most of the time when winter has gone sore, and it’s only ice, you can’t take a few steps forward without having the feeling that your blower is going down with you. And that’s why many of us choose to invest in tire chains to increase the traction. Now with the Compact Track, you don’t need to go through all that stress since it comes complete with 5½ -inch tires with snow track treads. 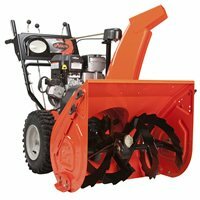 It opens up the possibilities for moving snow on dirt paths, grass lawns, steep gravel driveways and the like. The Ariens Compact allows you to achieve total control. A remote chute deflector that has a location on the dash helps in adjusting the level of the chute. Since the chute can rotate over 205-degrees, you can rest easy as you throw the snow where you’re not making a comeback anytime soon. This blower benefits from the Disc-O-Matic transmission drive. It assists in the shifting of the unit from any direction and also comes in handy when controlling the speeds. The Ariens Compact is for the medium sized residential driveways in areas that receive heavy snowfalls. You are not left out to choose big machines when this one gets the job done with little hassle. With it, you’ll complete tasks fast and effortlessly. Only; you need to pack some energy when turning this unit. Apart from that, other features are well-intended to provide high-performance and efficiency and it can be named of the the best ARIENS snow blower. 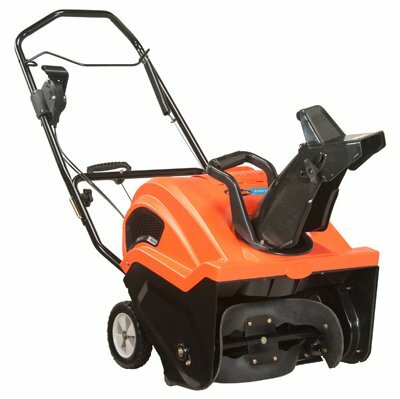 Commercial users are not left out by Ariens. The Professional model comes to cater for large residential estates which also need a touch by a powerful machine. This unit has all steel construction including the handlebars to direct the muscle. Struggling to direct a tool that weighs a couple hundred pounds can be troublesome. It’s always good to have the blower work for you and not the other way around. This machine applies a hydrostatic transmission such you just dial in the speed, and it follows suit. You don’t have to direct and turn the unit by yourself thanks to the auto-turn steering. It is best for steep areas where the snow is deep to over 23 inches. The drive system allows it to plow through deep snow while the drift cutters clear the way as you move at your pace. It is a big machine but controlling it is a walk in the park. When the handlebars have a steel construction, you can imagine how cold and stiff they can get in frigid weather. But Ariens comes in to warm them up by providing heated grips. Your gloves can keep you warm, but the Ariens Professional keeps you warmer. What better way to move snow than at your convenience? The provision of halogen headlights gives you the lighting you want when winter weather dims the solar. The chute is dash-mounted in that you can control the level and direction of the throw in easy steps. A lever is also up to the task of directing the height of the snow, and as such, your blowing experience is at its best. It also carries reversible skid shoes to take you through all types of surfaces. The Ariens Professional is only for those with vast and expansive areas to blow snow, like hotels and commercial landscapes. It is built to tackle all types of snow on all surfaces. The 420cc engine and steel body is deemed to last a very long time. The performance beats every other heavy-duty machine out there. Storing this machine is going to need a space that is larger than usual, so it’s crucial that you consider that aspect. Not everyone requires a huge investment in a snow thrower. If you live in areas where the snow does not sink very deep, is fluffy and light, the Ariens Path-Pro can make fast your snow blowing tasks. It is a single stage blower meaning that it comes with an auger drive where the wheels are not self-propelled. This is not any trouble at all since it weighs very little. You’ll not be expending any much energy, but still, you get to complete the tasks ahead of time. This blower comes with an Ariens exclusive engine which has a 208cc displacement. It’s not your typical single stage blower. You’ll love that it can throw snow to 35 ft with the auger system which comes along with a scraper. It can make a 21-inch path by 12 inches deep which means its only intended for light snowfalls. Nevertheless, it clears down to the pavement to leave each inch of track clean. You’ll be able to create a path for your kids, pets and other small home equipment. This unit comes with an adjustable chute which rotates over 200-degrees. It helps in controlling the discharge such that you won’t go over the paths you’ve just cleared. With the rubber paddles, every inch the machine touches is clean to the surface. The Path-Pro boasts pneumatic wheels which help to move through drifts with ease. The wheels are wide and dense to ensure that they can take a beating. The traction observed is great seeing that it can withstand pushing on wet grounds. The Path-Pro is fashioned with ergonomic handles. They are adjustable to go along with your height. As such, you are free from backaches and strains since you’ll not be hunched. What’s more, when it comes to storage the folding handles will allow you to store it in tight spaces. Maintenance has been made a breeze with an easy to access hatch. The gas and oil chambers are housed in a cowl which ensures dust and debris do not gain access. This means you’ll not be spending hours cleaning. The Path-Pro is no beast, but it’s the best in its single-stage class. For those who own small-sized residential homes investing in this model is a sure pick. You can depend on the construction, clearing capacity, and maneuverability. Since you can control the throw which is not usual in a single stage blower, it makes this design unique to fast snow blowing. But don’t take it through long driveways if you don’t have a few hours to throw away. The Ariens Platinum is top of the game when it comes to meeting all the requirements for residential homeowners. It is not a massive machine, but it’s still bigger than the compact. You can find a place to store it when it’s offseason, but as the winter months draw near, this is the time to invest in the Platinum. Starting with some innovative features like the Super-High Output impeller which can throw snow up to 55ft. The Platinum comes with a distinct Electronic Fuel Injection engine which ensures the power is consistent. You’ll love that it facilitates a quick start with an ignition key. It also eliminates most of the maintenance work since by controlling the fuel intake, it achieves fuel economy. This means it can operate at full speed without emissions. It also has an electronic governor that sees to it that speed is not lost. The Platinum also enjoys the Disc-O-Matic Drive. You’ll be able to control the machine and keep it in a consistent forward direction. It also comes in handy when it’s time to controlling the speed by providing swift speed shifts. When it comes to navigating around corners at the end of your driveway, you’ll love working with the auto-turn steering system. This means you’ll not labor with a heavy machine trying to get it to turn. First, the heated handgrips to keep your hands toasty, second the remote directional chute. You don’t need to leave your workstation. It has a lever that works tirelessly to adjust the height of the chute up or down in the angle you like. The chute can make 200-degree rotations so that you throw the snow to the position you like. The dash has a unique feature that allows it to lock the handles for one hand operations. It eliminates the need to stop when changing the direction of the throw. The Ariens Platinum fulfills the snow blowing desires of homeowners. It is a compact for easy storage, clears deep and wide, plus it has a durable construction. It is designed for all the persons who are a bit slow in delivering after-service to their power tools thanks to the EFI engine. Ariens boasts a long history in manufacturing outdoor power equipment. Their products are manufactured and assembled in the USA which is a plus to most of us. Their most notable products are snow blowers since they beat the competition owing to great features in innovative designs. Their blowers bear all-steel constructions with cast iron gear cases. They are built to meet diversified demands from small homes to commercial estates. Picking an ARIENS snow blower means performance, versatility, and reliability. I hope you liked our top 5 ARIENS snow blower and hope to see you soon.